Dear Sir/ Madam, This is bring to your kind attention that, I , Ms Ankita Jena booked a flight ticked this morning on 7.25 am, Dt 06/11/2017, PNR- KLZ2XM, through GoIbibo for Air Asia. 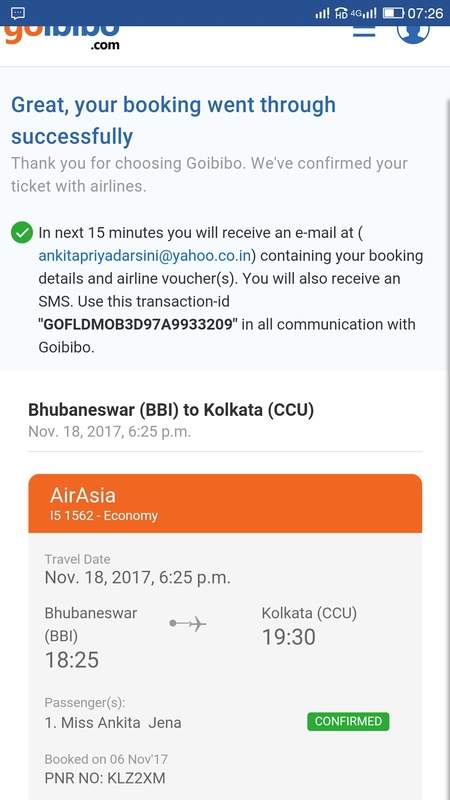 The flight price was reasonable and since all the railway tickets were cancelled for the evening, Dt 18th Nov from Kolkata to Bhubaneswar, I thought of taking flight would be an ideal option. But to my mistake, I booked the flight from Bhubaneswar to Kolkata instead of Kolkata to Bhubaneswar. I realized the same just after 30 sec of my booking and considering my mistake, I wanted to reschedule / Change immediately. But to my utter surprise the GoIbibo and Air Asia denied to listen even after several request and rejected all humanitarian issue. They wanted me to cancel and rebook the ticket and offered only Rs 46 in return. This seems very atrocious on the part of a customer since the consumer applied only after 30 sec and even in this case they are galloping entire money except Rs 46. Now the basic question comes like what kind of corporate practices these companies are having, what would a girl do since she has consumed all her money and how would she return without money? Why these companies are not practicing any CSR (Corporate Social responsibility) and how come they are charging and looting money from we customers but deny to cooperate even at the time of actual need. I have the entire tele-recording of the issue how they are so insensitive to basic humanitarian issues. Such evil corporates must answer for their such evil corporate policy and all consumer must be aware of them. This is a fight for justice for a victim like me who is left unmoneied by these corporates and financially strangulated by them. Today this is a case with me and tomorrow this case of Air Asia and Go ibibo can happen with anyone. Let's stand united before these draconian corporate policy take over human values and innocent customers like us.